In a broader sense, bremsstrahlung is the radiation emitted when any charged particle is accelerated by any force. To a great extent, as a source of photons in the ultraviolet and soft x-ray region for the investigation of atomic structure (particularly in solids), bremsstrahlung from x-ray tubes has been replaced by synchrotron radiation. Synchrotron radiation is an analog to bremsstrahlung, differing in that the force which accelerates the electron is a macroscopic (large-scale) magnetic field. (brem -shtrah-lûng) (literally: ‘braking radiation’) Electromagnetic radiation arising from the rapid deceleration of electrons in the vicinity of an atom or ion. It has a continuous spectrum. See synchrotron emission; thermal emission. charged particle, that is, an electron, will be millions of times more intense than the bremsstrahlung emitted by a proton in the same field. For this reason, the bremsstrahlung most often observed and most frequently used in practical applications is that resulting from the deflection of electrons by the electrostatic fields of atomic nuclei and electrons. In particular, the X rays generated in X-ray tubes and the gamma radiation emitted by fast electrons during their passage through a substance are of this nature. The spectrum of the bremsstrahlung photons is continuous; it breaks off at the maximum possible energy, which is equal to the initial energy of the electron. The intensity of bremsstrahlung is proportional to the square of the atomic number Z of the nucleus in whose field the electron is retarded. This circumstance can be explained by reference to Coulomb’s law and Newton’s second law: according to Coulomb’s law, the force f of interaction between the electron and nucleus is proportional to the charge of the nucleus Ze, where e is the elementary electric charge; according to Newton’s second law, the acceleration is a = f/m. When an electron with energy greater than some critical energy E0 moves in a substance, the electron is slowed primarily through the generation of bremsstrahlung. 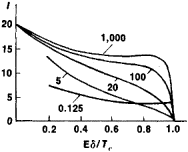 For example, E0 = 10 million electron volts (MeV) for lead and E0 ≈ 200 MeV for air. At lower energies, energy losses as a result of excitation and ionization of atoms predominate. The deflection of an electron in the electric field of a nucleus and atomic electrons is a purely electromagnetic process and is most accurately described by quantum electrodynamics (seeQUANTUM FIELD THEORY). For electron energies that are not extremely high, good agreement between theory and experiment can be obtained by considering only the Coulomb field of the nucleus. According to quantum electrodynamics, within the field of the nucleus there is a definite probability of the quantum transition of the electron to a state of lower energy with the emission of, generally, a single photon (the probability of the emission of a greater number of photons is low). Since the photon’s energy E is equal to the difference between the initial and final energies of the electron, the spectrum of bremsstrahlung (Figure 1) has a sharp boundary at the photon energy that is equal to the initial kinetic energy of the electron Te. The probability of radiation during the elementary deflection event is proportional to Z2; consequently, targets made of materials with a high Z, such as lead and platinum, are used to increase the yield of bremsstrahlung photons from electron beams. is made use of to obtain intense high-energy photon beams in electron accelerators. Bremsstrahlung is partially polarized. The theory of bremsstrahlung can be further refined by taking into account the screening of the Coulomb field of a nucleus by the atomic electrons. Corrections for screening are substantial at Te >> Mec2 and Er << Te. These corrections decrease the probability of bremsstrahlung, since the effective field is weaker than the Coulomb field of the nucleus. The properties of the bremsstrahlung produced in the passage of electrons through a substance are affected by phenomena associated with the structure of the medium and with the multiple scattering of the electrons. If Te >> 100 MeV, multiple scattering shows up in another way: during the time required to emit a photon, the electron travels a considerable distance and may experience collisions with other atoms. 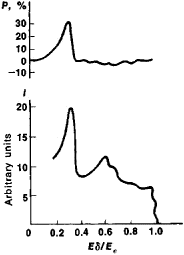 Generally speaking, in amorphous substances multiple scattering at high energies results in a decrease in intensity and a widening of the bremsstrahlung beam. The passage of high-energy electrons through crystals results in interference phenomena: sharp maxima appear in the bremsstrahlung spectrum, and the degree of polarization increases (Figure 3). Thermal motion in a hot rarefied plasma (with a temperature of 1050 – 1060 or higher) can produce substantial bremsstrahlung, which is sometimes called thermal bremsstrahlung. The elementary bremsstrahlung events are due to collisions of the charged particles making up the plasma. Cosmic X rays, which became observable with the advent of artificial earth satellites, apparently are, to some extent, thermal bremsstrahlung. Indeed, the radiation of some discrete X-ray sources may consist entirely of such bremsstrahlung. Bremsstrahlung in the X-and gamma-ray regions is widely used in technology, in medicine, and in biological, chemical, and physical research. Akhiezer, A. I., and V. B. Berestetskii. Kvantovaia elektrodinamika, 3rd ed. Moscow, 1969. Baier, V. N., V. M. Katkov, and V. S. Fadin. hluchenie reliativislskikhelektronov. Moscow, 1973. Bogdankevich, O. V., and F. A. Nikolaev. Rabota s puchkom tormoznogo izlucheniia. Moscow, 1964. Sokolov, A. A., and I. M. Ternov. Reliativistskii elektron. Moscow, 1974. Radiation that is emitted by an electron accelerated in its collision with the nucleus of an atom.